Streets Process Colour has chosen three Renz systems from The Binding Store to bring high quality wire binding in house. 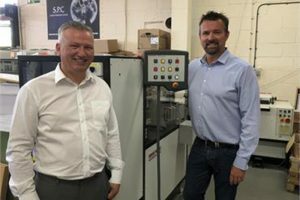 The Baldock litho, digital, web and large format print service provider will also offer a trade service following its investment in a new Renz AP360 high speed automatic punching system and a fully refurbished Renz Punch 500 ES and RSB 360 wire binder. Managing Director Richard Street explains: “Just over two years ago we decided to start bringing all our finishing services in-house. This was to reduce the turnaround times and ensure we had full control over the whole process. It sits alongside the versatile Renz P500 ES. It can handle all types of books and calendar punching production with ring wire, plastic comb and coil options. It enables fast die changes and incorporates two part split dies for book and calendar work. It has a QSA (Quick Size Adjustment) for high flexibility of different paper formats, horizontal paper feeding and can handle a wide range of mixed stocks. Completing the trio is the quiet, easy to use 2000cph RSB 360 that is completely equipped for binding wire diameters ranging from ¼ inch to 1inch 3:1 and 2:1 pitch. It can bind widths up to 360 mm while the closing unit is adjustable for books up to 20 mm thick. Adds Street: “We did look at what was available on the market but we liked the Renz systems because of their level of automation. They were easy to use, quick to set up and very cost effective. There is no need to spend lots of time getting jobs on them so we can be very productive very quickly.